Bitcoin began trading on August 17 at $4,287 (GMT 00:05), and by noon (GMT 12:00), a new $4,480 all-time high was once again achieved. Since then, the price has been in free-fall, and is currently hovering around $4,000. At the same time, bitcoin cash rose dramatically, by more than 200% in the last 36 hours alone. 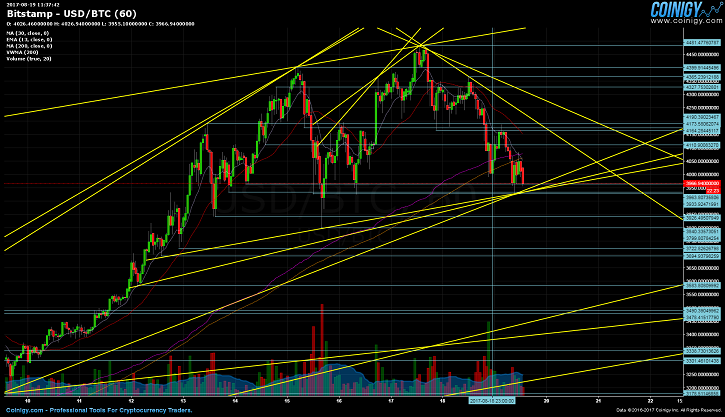 It is on a bullish upward trend, and the price has easily crossed above $800, which is now serving as a support. An inverted correlation between the competing chains, seems to be rather obvious at this point, although the older chain does have a proven track record, and ample prior history unlike the former. Mainstream media is continuing to cover crypto currencies, with bitcoin is at the forefront of course. CNBC is citing targets as high $6,000, forecasts which appear rather redundant at this point. Exotic price predictions are rampant on social media as well. Even Max Keiser has begun to heavily promote the first, and original crypto currency, who is rather famous for promoting start coin. As for something more substantial, Bloomberg had a rather interesting video piece on mines in China, and a supplementary article, on why investors see bitcoin as a better opportunity than gold. Additionally, new articles from independent sources have started popping up, explaining the intricacies of the whole process in more detail. Figuratively speaking, bitcoin will be zooming past the earth’s atmosphere soon, at least according to Blockstream, which has started to hint at launching a satellite, one that will be used to exclusively transmit bitcoin blockchain data and transactions. Erik Finman, a self-proclaimed bitcoin millionaire, plans to work with NASA in order to advance the fintech industry. A video trailer providing further details is available here. Segwit has continued to clear blocks, the activation period looks to be completed on August 23 (GMT 01:00), if the existing pace and momentum is kept up. Still, there is the added threat of another fork, creating a third version of bitcoin. Scheduled for November, the probable split is expected to happen at the 494,784 bitcoin block, which is less than 15,000 confirmed blocks away. Coindance has sustained, and has continued to meticulously track the politics behind all of the drama, as well as block, and node information. 5872 Core nodes are dominating over the network, with 955 UASF nodes in second, and 905 ABC nodes at a close third place. Bitcoin unlimited holds 708 nodes at the time of writing, and everything else is below 168, with some categories clenching to single and double digit numbers. The day started off at a $4,144.58 price point (GMT 00:05), and it took less than 9 hours to achieve the existing daily low of $3,927.87, which has so far remained unbroken. The rest of the afternoon was primarily characterized by short sideway price oscillations, restricted to a range between the $3,927.87 daily low and $4,110.90 daily high.